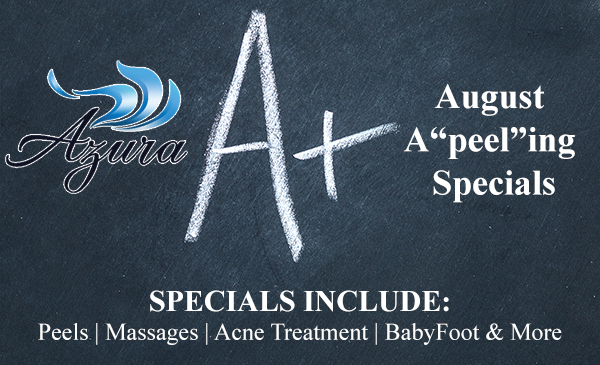 Specials on peels, acne treatment, massages, and more at Azura this month! A new school year and a new schedule can add stress to your body, but don’t let that stress show on your skin! While it may be tempting to squeeze break outs at home, this can lead to worsening acne and scarring. Leave the acne treatments to the experts at Azura. This month, purchase an acne treatment for $90 – regularly priced at $125. Add on an acne salicylic peel to your treatment for just $65 – normally priced at $100. Or, purchase a pre-pay package of acne treatments at this special price of three treatments for $225.00! Though the kids are back in school and summer is winding down, your own wellness is still a priority. Get a one-hour massage while your teen is getting an acne treatment at Azura! You’ll both depart in pampered bliss – or you each can fly solo and enjoy the savings and much needed massage time. Purchase a one-hour massage this month for $85, regularly priced at $95. Returning home from summer vacation? Banish the signs of summer sun damage and produce younger and healthier looking skin with a chemical peel selected for your skin type. Consult with Dr. Stevens or Jennie Kowaleski PA-C to help select the peel that will work best for you and our fantastic aestheticians, Michelle V. or Hope H., will perform the peel and walk you through the process. Peels offered are lactic acid, glycolic, salicylic, PCA Sensi peel, PCA peel with hydroquinone, PCA Ultra Peel I, and ZO Three-Step peel. Our peels range from $85 to $289, normally, but this month you can enjoy all peels at 20% off. Additionally, any post peel products for home use will be 10% off, too. BONUS: Schedule a follow-up microdermabrasion on the day of your peel for additional exfoliation three to four weeks after your peel, based on peel choice, for only $59. Though it was fun putting your pedicured feet on display this time of year, the hot concrete and sandy beaches can roughen them up. We’ve got the solution! BabyFoot is an at-home exfoliation kit (and an Azura employee favorite!) that restores softness by removing layers of dead skin cells. Purchase one BabyFoot package for $25 and get a second package 50% off all month long in August.